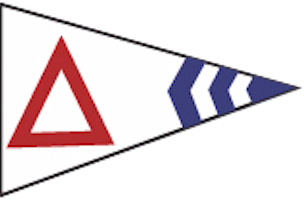 The pennant chosen for the SJDPS has a field of white with a red delta character symbolic of the Delta waterways. The three blue chevrons represent the Squadron's heritage from the parent, Diablo Power Squadron and are also indicative of the three major rivers in the Squadron's service area; The San Joaquin, The Sacramento, and The Mokelumne. San Joaqin Delta Power Squadron Heraldry information was compiled by P/R/C Alice Ringger, AP a member of the Historian Committee from information submitted to HQ by individual squadrons.